Located in the Tioga State Forest, the Pine Creek Gorge, typically referred to as the Grand Canyon of Pennsylvania, stretches for over 45 miles with depths of nearly 1500 feet. The dynamic topography features stunning forested views and steep canyon walls. Colton Point on the west rim and Leonard Harrison on the east rim of the canyon are the "Must See" vistas to visit. One the east rim of the Canyon, the 585-acre Leonard Harrison State Park offers the most famous scenic view of the PA Grand Canyon. The Park has modern facilities, a visitor center, and easy to navigate walkways to viewing areas. On the west rim of Pine Creek Gorge, the Pennsylvania Grand Canyon, the 368-acre Colton Point State Park offers stunning views. The rugged pavilions and overlooks resonate with the history and rustic charm of the Civilian Conservation Corps era of the 1930s. In addition to the Pine Creek Rail Trail in the bottom of canyon and adjacent to Pine Creek, there are many miles of trails for hiking in the surrounding Tioga State Forest and accessible from both Leonard Harrison and Colton Point State Parks. The West Rim Trail, a 30-mile hiking trail, is maintained along the western rim of the Grand Canyon and a favorite of backpackers. Many vistas have been cleared along the trail to provide hikers with views of the Pine Creek Valley. The Barbour Rock Trail provides a one mile round trip from the parking area along Colton Road to Barbour Rock Vista which overlooks Owassee Rapids on Pine Creek. A handicapped accessible trail provides a leisurely trip to the vista. Another popular yet challenging hike is the Turkey Path Trail from Leonard Harrison State Park, a 2-mile trek down to the Pine Creek Trail. 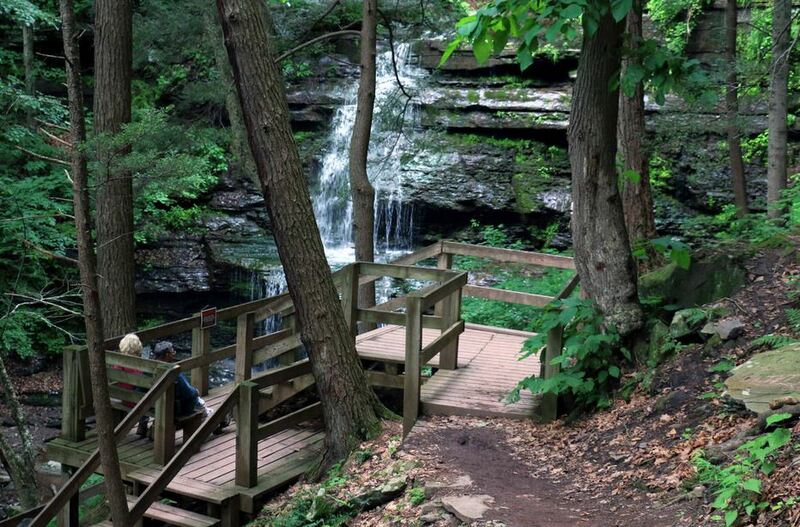 Learn about the rich history of the Civilian Conservation Corps (CCC) at Leonard Harrison State Park, where you will find interpretative signage and one of the Pennsylvania Wild's four CCC Worker Statues. The CCC Work Statue series is spread across multiple US States, with a goal of educating Americans on the legacy of the CCC and the value of natural resource conservation and stewardship of public land.